Dental fillings, made from either amalgam or composite resin, are used to fill in cavities left behind by tooth decay. This procedure is quick, taking only one visit, and protects the affected tooth from new bacterial invasion. There are some instances, however, in which your dentist may suggest a dental crown over a filling. 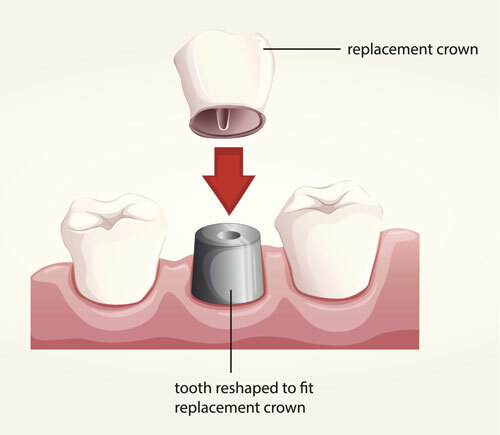 A dental crown is a "cap" that is placed over your tooth, covering the entire visible surface. Typically made out of ceramic, a crown seals out bacteria, preventing future issues. Crowns are a more expensive restoration than a filling, and require more preparation (as well as two visits), but there are a few circumstances in which they are a better solution. Generally speaking, fillings are an excellent solution for minor decay damage. Fillings preserve more of your natural tooth. However, if you have substantial decay, a large filling can do more harm than good. Large fillings leave your tooth weak, as severe decay (and drilling to place fillings) impacts its integrity, leaving is susceptible to damage. Fillings are not designed to provide strength. A crown, on the other hand, is. Because the crown caps the tooth, it holds the tooth together, reinforcing it. Because of this, it protects your tooth while chewing, and greatly lessens the risk of harm. Another problem attributed to larger fillings is the potential for wedging. Fillings are placed directly in the tooth. While small fillings don't usually pose any problems, large fillings can act as a wedge, especially when subjected to stronger biting forces, splitting the tooth and possibly shattering it, which could then mean you would need the tooth pulled. A crown, though, doesn't pose this risk. Instead, it encases the tooth, and holds it together. A root canal is performed when you have an infection inside your tooth. During the procedure, your dentist removes not only the infection, but the root and the pulp of your tooth. Even though the tooth is filled, the structural integrity is not what it once was. A crown helps to provide strength as well as protection from reinfection. A tooth that has suffered from decay needs to be addressed. Contact our office today we will assess your tooth and help you to decide whether a filling or a crown is your best option.